In 1802, an American sea captain published a book which changed the maritime world. More than just a sea captain, the author had taught himself math, sciences, and languages…and he wanted to make the world of sailing and voyaging safer for captains and crews. The New American Practical Navigator became the guidebook for maritime voyagers in the 19th Century, and it’s still referenced today. Some might argue that this blog post is out of order since the book published prior to the War of 1812 and last week’s post talked about relations with Japan in the 1850’s. However, the far-reaching influence of Nathaniel Bowditch’s book makes it a relevant topic at just about any point in our study. So…without further ado, we’ll glance backward for a few moments to learn more about the author and then return to the mid-19th Century timeline marker to comment on the book’s effects. Bowditch taught himself algebra, calculus, French, and Latin. He started copying and translating famous works on math and science. He made five international trips on merchant ships, captaining his last voyage. Bowditch wanted to share his knowledge, navigation skills, and practical seamanship with others to save lives; he knew too many captains and crews lost at sea because they hadn’t known how to navigate or make “simple” calculations. 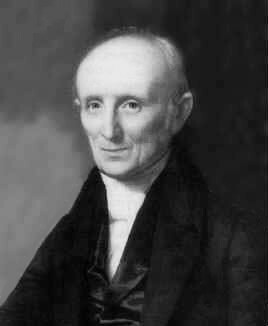 His book was published in 1802, the same year Bowditch received an honorary masters degree from Harvard University. He was honored with memberships in the American Academy of Arts and Sciences, the American Philosophical Society, and the London Royal Society. Throughout his life, he received offers to teach at American colleges, but he refused, preferring to serve as president of a marine insurance company, spend time with his family, and continue translating scientific works. Bowditch died in 1838, leaving behind a large scientific library to the care of his sons and a book which changed the American maritime world. Transcribed mathematical papers from the Philosophical Transactions of the Royal Society of London. Bowditch decided to research, write, and publish his own navigation book after discovering all the navigational errors in Moore’s Navigation which was supposedly the top-navigation book the era. As the historical legend goes, he refused to write anything that he had not taught to a ship’s crew, and supposedly the twelve sailors on one of his ships learned to take astronomical observations and calculate the ship’s location for navigational purposes. 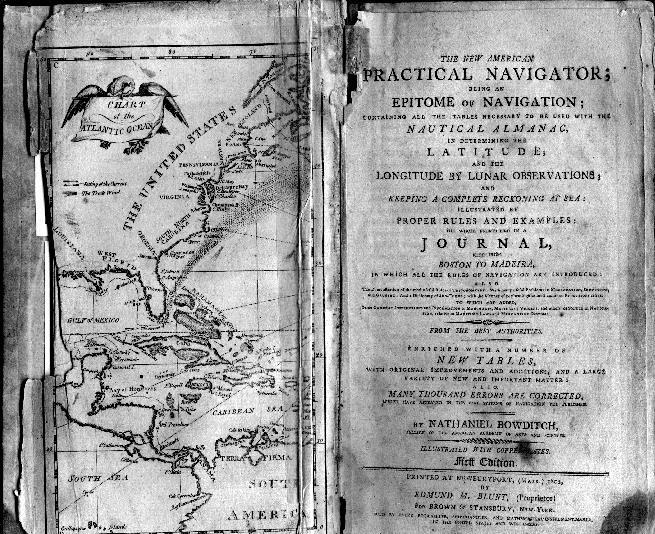 The New American Practical Navigator was released by American publisher Edward Blunt in 1802, containing practical information, new solutions for navigational problems, and tables of mathematical formulas necessary for successful voyages. By 1866, a United States agency purchased publishing rights and agreed to keep the work updated and current; it is still a guidebook at the U.S. Naval Academy and regularly referenced by modern day seafarers. By writing in a language understood by the maritime community of his era, Nathaniel Bowditch wrote a book that literally saved lives. American captains and crews no longer had to rely on faulty calculations and had an abundance of knowledge available to make their voyages safer. Most vessels carried (and many still carry) a copy of The New American Practical Navigator; as the decades went by, the book’s name simply became Bowditch’s. Merchant ships, whaling vessels, navy craft, and others all carried Nathaniel Bowditch’s book, relying on its information to get them safely home. P.S. Extra, extra… Have you read the historical fiction novel Carry On, Mr. Bowditch by Jean Lee Latham? It’s a fascinating glimpse and imagining of his life and motivation to write his book. Hi, Sarah. Yes, my wife and I really liked reading Carry on, Mr. Bowditch. I highly recommend it.